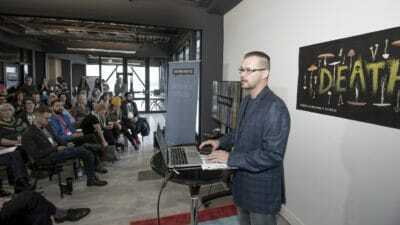 In June of 2016 Stephan started hosting the Calgary Chapter of CreativeMornings. It’s a monthly breakfast lecture series for all kinds of creative types. Each event is 90 minutes and features a light breakfast including awesome coffee and snacks, a short presentation, and a short Q&A. The presentation is on a theme and all 104 international CreativeMornings chapters speak on the same theme each month. The speaker is almost always someone local, and we try to shoot for people outside of the normal digital designer crowd to keep it fresh and interesting.